It's a long time since I've done a post listing my bookcrossing to-be-reads. Click on the photo to see it on flickr, where you can mouse over the books to see the titles and journal links. Looks like 57. Last time I did this, a little over a year ago, I had 43 to read. Hmm... not going the right way! See, I'd want to split out into fiction, which I'd read beginning to end, all the way through, and non-fiction, which I might use as a reference to dip into, or pick a few sections out of. I'd end up only looking at the pictures in the ones about pilates and the alexander technique. Yep, and the craft ones will likely just be used for reference. But so far, I haven't had a proper flick through them. When I have, I'll probably switch them to Permanent Collection. Or pass them on, depending. Now that I think about it a bit more, if I was going to split them, it wouldn't be into fiction and non-fiction, as some of the non-fiction are things to read beginning to end, like the Meme Machine, Conciousness and Fire in the Equation. They are things to pick up and put down - I've started them all - but I intend reading all the way through, not picking and choosing. Conciousness makes that hard - it has proper chapters, then interspersed pages that interrupt and the switch back isn't properly signalled. That's why I put it down. The text is not difficult, but the layout is. flick through it and cut out all the interspersed pages! Good idea! Where's my scissors? Given the nature of the book, I should treat it more as brain surgery than dress making. A simple joke, I hope. I loved "The Diving Bell and the Butterfly", but the movie I'd rather see is "My Stroke of Insight", which is the amazing bestselling book by Dr Jill Bolte Taylor. It is an incredible story and there's a happy ending. She was a 37 year old Harvard brain scientist who had a stroke in the left half of her brain. The story is about how she fully recovered, what she learned and experienced, and it teaches a lot about how to live a better life. Her TEDTalk at TED dot com is fantastic too. It's been spread online millions of times and you'll see why! How many is a load? Probably giving them to a charity, or a second hand bookshop. They may end up pulped though, from what I hear. Offering them up on freecycle is another option. If you want them bookcrossed, but don't want to do it yourself, I could take some, say a boxful, but I wouldn't be able to take hundreds. If you give me a list of types of books, I could see if there's takers on the BCie list. There may be other people than me willing to a number of random ones too. If you do want to bookcross them yourself, you can print out a page of pre-numbered labels in one go, but you should still type in the details (isbn or name and author; genre) for each one. You could then have a release day (or number of days, if not using a car) where you (and willing helpers) walk along with an armful of books, putting them down on any available surface - bench, window cill, phone box. You could either skip the release notes, or make them vague. "Somewhere in Trinity", "somewhere in city centre". Release notes are not necessary, but they alert other bookcrossers so they can look for them, and also help you keep track of how many you've released. There's a couple of places we've left a few books, and they don't mind. There's a cafe on Abbey St, just round the corner from Capel St. It used to be called C2K, but I think it's changed. They have a shelf. When we met in the Westmoreland, on Westmoreland St, they didn't mind us leaving books on the shelf to the left as you go in. We've left a lot of books over a period of time in the Library Bar in the Central Hotel on Exchequer St. The remaining few have ended up on the bookshelf immediately to the right as you go in. And there's a Douglas & Kaldi in Ongar where it's apparently ok, but I've never been. It's good form to buy a drink or something if you use any of these places. I was assuming you had a big pile set aside already. And that you have internet access at home. Are you internetless again? If you have access and you're going be picking out a handful of books at a time, it's easier to manage. Select from bookshelf, put handful on desk, register, label and set aside for releasing/giving to other bookcrossers. The amount of work is variable, depending on how much you want to put in. There's someone who brings books to meetings unregistered, and is happy just to pass them on. You can register and just write the BCID number on the first page, if you're giving them to other bookcrossers, who will know what the number is about. If releasing in the wild, you'll need more explanation than that - either a written message, a sellotaped on printed label, or a bought label. I like to add more - a post it on the front, a small sticker on the back and spine. Another option, because you're a speshul frend, is create an account and give me the password and up to a box of books. I'll register them for you (gradually, because I also fail at organisation) and either give them back to you for you to release if you wish, or release/pass them on myself. That can be the hardest part. I've found it easier since bookcrossing - because the book is still on my virtual shelf, I still have some connection to it. OTOH, even if I hate a book, I now find it hard to get rid of without registering it. Only 57?! Behind me are piles of books, some ceiling high to be read & that's only the start ~ there are piles & bookcases full in the garage & container, plus unpacked boxes... I would say nearer 5,000 than 50 here! I rescued & gave a loving home to a room full of books that were going to be dumped/burnt. They were put in the old kitchen of the place where I worked at a Play Group/Pre-School. 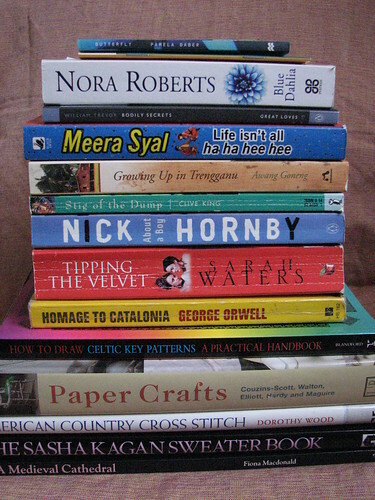 A lot of those I rescued went to a charity shop, but there were so many lovely books that I kept for me ~ some in sets. I will read them some day. Some in my TBR range are herbals, smallholding, livestock or wildlife books that I may just flick through rather than read from end to end. I'm a librarian, I feel naked without a covering of books!